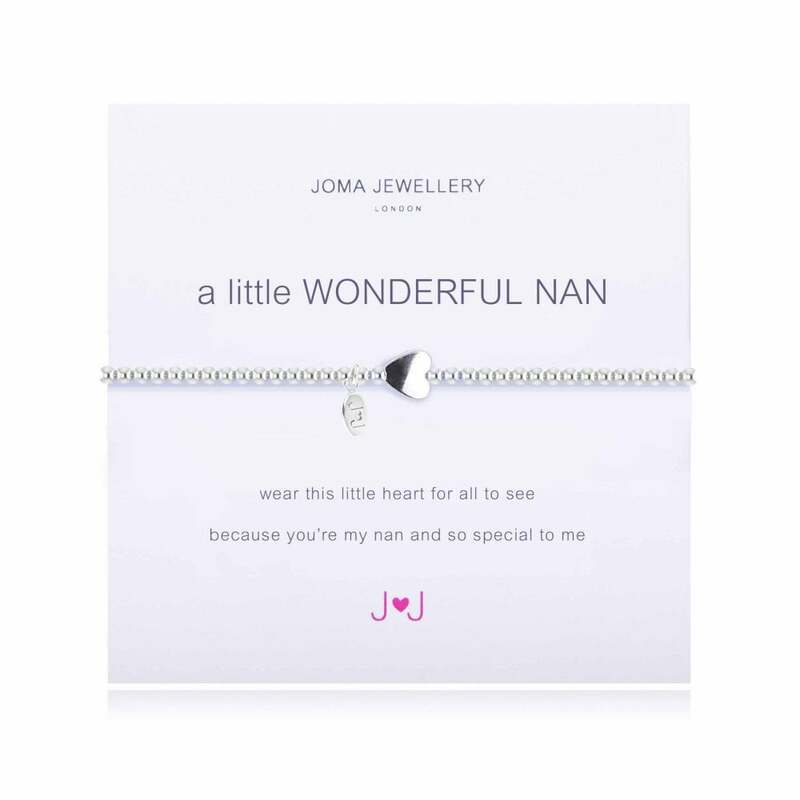 This stunning A Little Wonderful Nan Bracelet by Joma Jewellery is an ideal gift if you're a dreamer who loves a little sparkle! Made from plated silver and presented on an official Joma card which reads 'Wear this little heart for all to see because you're my nan and so special to me. The perfect gift to show your amazing nan how much you appreciate her, this gorgeous bracelet is made from a row of silver plated beads and is adorned with a delicate shining rounded heart, the ideal for your special nan. It is displayed on a presentation card which is then placed in a beautiful gift box. All ready to gift. You can also write your own personal message to the back of the presentation card to personalise your gift. Each piece of Joma Jewellery comes in a gorgeous Joma gift bag with a gift tag for you to write the recipients name for easy peasy gift giving. Please keep your item dry at all times and away from perfume and body creams in order to preserve any plating and to ensure your piece lives a long and beautiful life.